Our I Care Lapel Pin is a unique design, die struck from jeweler's metal with a beautiful red enamel color heart shape, nickel plated and polished to a great shine. This is perfect for the one special Volunteer who makes a difference or for your team of volunteers to wear at a special event. A Dynamic pin for volunteers at Hospitals, Schools, Fire and Police Departments and Municipalities. Each pin includes a standard clutch back and individually poly bagged. 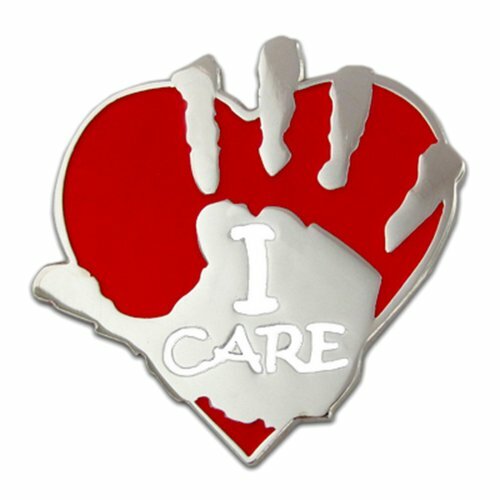 I Care Lapel Pin. A unique design, die struck from jewelers metal with a beautiful red enamel color heart shape, nickel plated and polished to a great shine. This is a perfect token for the one special Volunteer who makes a difference or for your team of volunteers to wear at a special event.